The Communist Party of Canada welcomes today’s Federal Court of Appeal ruling which overturns the federal government’s approvals to build the Trans Mountain expansion project. 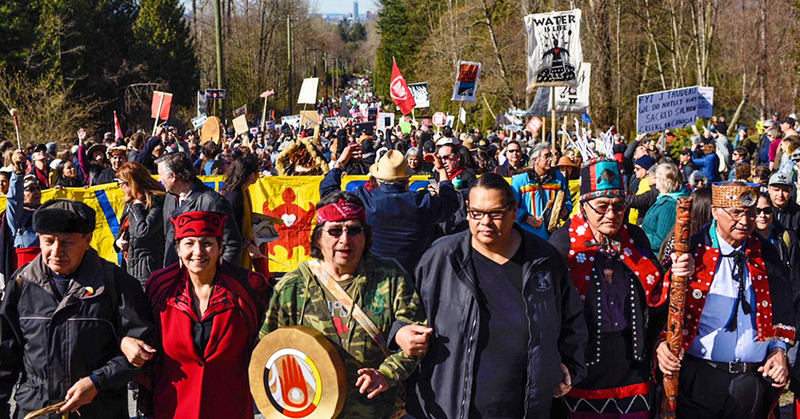 This decision builds upon decades of legal and political struggles by Indigenous peoples in British Columbia and across Canada; it is truly a historic victory over the resource extraction corporations and other capitalist interests which have dominated this country since Confederation, and going back to the time of European colonization. We extend our warmest congratulations to the litigants in this case: Tsleil-Waututh Nation; Squamish Nation; Coldwater Indian Band; Aitchelitz, Skowkale Shxwa:y Village, Soow Ahlie, Squiala First Nation, Tzeachten, Yakweakwioose, Skwah, Kwaw-Kwaw-Aplit & Ts’elxweyeqw Tribe et al (Sto:lo); Upper Nicola Band; and Stk’emlupsemc Te Secwepemc, Living Oceans, Raincoast Conservation Society, represented by Ecojustice, and the cities of Vancouver and Burnaby and the province of British Columbia. Along with the grassroots resistance by thousands of protesters, including over 200 arrested for courageous acts of civil disobedience, these Indigenous peoples and their allies have won a critical round in the struggle to block this dangerous project, which threatens the lands and waters of western Canada. Those who have spoken out against the Trans Mountain pipeline expansion from the beginning, including the Communist Party, warned that the National Energy Board’s assessment was deeply flawed, and that the federal cabinet committed a grave error by granting final approval in November 2016. This view is vindicated by the ruling, which nullifies the certificate approving construction and operation of the project. The federal Liberal government wasted $4.5 billion of taxpayers’ dollars when it purchased this antiquated 1,150 kilometre fossil fuel expansion project from US-based Kinder Morgan. This government was elected on a promise to promote reconciliation with Indigenous peoples; instead, its arrogant response to today’s court ruling was to announce that the project would move forward. Similarly, after two summers of fire and smoke blanketing western North America as a result of climate change fuelled by unchecked carbon emissions, it is abundantly clear that expanded fossil fuel extraction poses a threat to human survival. The time is overdue for a rapid transition to different economic priorities. Instead of fossil fuel extraction based on huge profits for energy transnationals, we need public ownership and democratic control of natural resources, full recognition of Indigenous title and rights, massive investment in renewable energy and conservation projects, a strategy to phase out the tar sands, and action to provide energy industry workers with guaranteed employment in other sectors. This is a huge challenge; instead of bowing to the demands of wealthy shareholders to continue on the road to disaster, the peoples of Canada must take a different course, one that puts people and the environment ahead of private profits.